This is the back story to how the phrases “Real Lean” and “Fake Lean” came about. I was trained in Toyota’s production system by Shingijutsu consultants in the years 1994 through 1997. During that time it became apparent that most organizations were focused on Lean tools and ignored the people aspects of TPS – specifically, the “Respect for People” principle, which has long been associated with the practice of progressive management. This was a major error in the application of Lean management that needed to be corrected because it resulted in harm to people. Image from Lean leadership course lecture notes, circa 2002. So, I worked to correct this error in my job as a manager at Pratt & Whitney and later as a professor in higher education. When I joined academia in 1999, one of my interests was to develop a graduate-level course on Lean leadership. I thought it was important to highlight the contrast between organizations that did continuous improvement well and in ways that demonstrated respect for people (“the few”), compared to organizations that did continuous improvement poorly and in ways that demonstrated disrespect for people (“the many”). After all, Lean intends to correct two big problems in organizations: bad processes and bad management. But it usually corrected only one – bad processes. Correcting bad management became the subject of my first two academic papers in 1998 – “Continuous Personal Improvement” and “Lean Behaviors” – with Lean leadership becoming the focus of my research as an academic. Why? Because you don’t get good processes with bad management. I wanted my students to gain a clear understanding of the difference between good and bad Lean thinking and practice, and sought a simple phrase would draw out the contrast. Sometime in late 2000 or early 2001, I coined the phrase “Fake Lean.” Around that time I was also using the terms “False Lean” and “Imitation Lean,” but decided that “Fake Lean” was a better way to describe the tools-focused application of Lean that had become ubiquitous. I incorporated “Real Lean” and “Fake Lean” into my Lean leadership course and it proved to be successful in generating the needed contrast and led to important discussions on function of leadership and purpose of management. 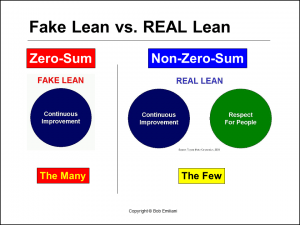 Notice that when I coined the terms “Real Lean” and “Fake Lean,” their meaning was very simple as shown in the image above: “Fake Lean” was the technical application of “Continuous Improvement” tools and methods, invariably in a zero-sum fashion. It is the dehumanized form of Lean which does not deliver good business results. Nor does it result in the development of human capabilities. “Real Lean” was the application of both “Continuous Improvement” and “Respect for People” – the two Toyota Way principles — in a non-zero-sum fashion. Students clearly understood the term “Fake Lean” in the neutral sense of characterizing a problem (the misunderstanding and misapplication of Lean principles and practices), not in the negative sense of criticizing any particular company or leader. Rather, Fake Lean was a common problem that affected (and still affects) most organizations – the reasons for which are now finally understood. The words “Real Lean” and “Fake Lean” succeeded in creating a memorable learning point for students, most of mid-level managers, which they would use to guide their efforts to become better managers and to improve processes. Many students used what they learned in their graduate studies to influence their bosses to understand and practice Real Lean. You are exactly correct! The last 9 years of my career as a USAF civilian lean six-sigma black belt were exactly as you described. I was one of an office of (originally 10) individuals who were trained and certified as black belts and later lead the Air Force Sustainment Center’s central lean program office (responsible for teaching, coaching/mentoring, process improvement facilitation and strategic planning) for the 40,000 plus person organization. As far as most leaders within the organization, we might as well have been stationed in another galaxy. Some did embrace us and use our skills, but most just ignored us. Others actively fought against our mission — to eliminate waste, as the 6 probably saw us as a threat.